The current total population of Nile Basin countries is estimated at 487.3 million. Ethiopia has the highest population (99.4 million) closely followed by Egypt (91.5 million) and DR Congo (72.1 million). Eritrea (5.2 million), Burundi (11.2 million) and Rwanda (11.7 million) have the smallest populations. The combined population living within the Nile Basin is estimated at 257 million (or 53% of the total population of Nile Basin countries). Egypt has the highest population living within the Nile Basin (85.8 million), followed by Uganda (33.6 million), Ethiopia (37.6 million) and Sudan (31.4 million). Eritrea (2.2 million) and DR Congo (2.9 million) have the smallest populations within the Nile Basin. 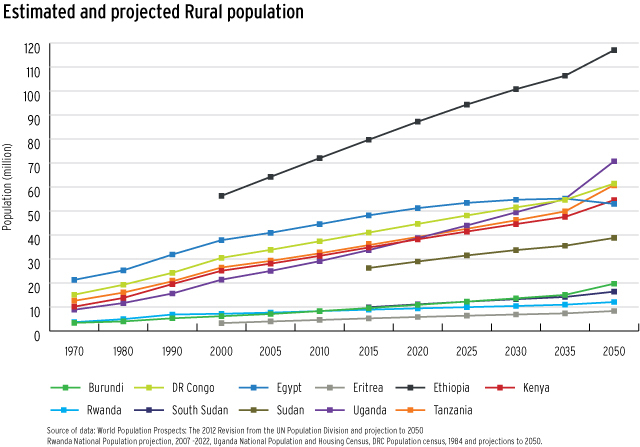 Projections of urban and rural population growth are shown in adjacent charts. The proportion of urban population is expected to rise in all Nile Basin countries. By 2050, the percentage of urban population is expected to reach above 50 percent of the total population in four of the 11 Nile Basin riparian states. In seven countries the urban population makes up more than 40 percent of the total population. In contrast, the rural population is expected to rapidly shrink in all countries. With increasing urban population, urbanization rate will increase. This, in turn, will result in increased demands for better water supply, sanitation, electricity, communication and other services. Urbanization is expected to increase the pressure on natural resources and the environment as expansion of cities occurs generally at expense of destruction of forests; there is risk of increasing pollution of water resources. The largest share of Nile Basin countries’ population is rural. Burundi has the highest proportion of rural population followed by Uganda and South Sudan, while Egypt has the least rural population. 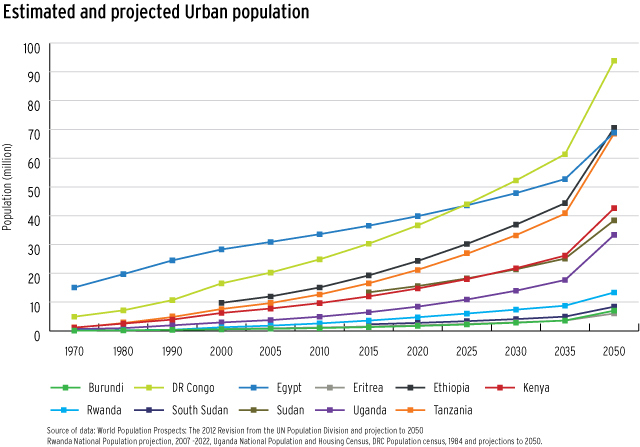 Over the next 30 years, however, the proportion of urban population is expected to rise in all Nile Basin countries.